1.System Permissions include the modules that a Users can access. In the image here the Yearly Plans, Performance Summary Reports, My Resources and Performance Alerts Modules are System Permissions that have been included in this Role. 2. The Data Permissions will be seen when the user selects to "Enter Data For Athlete", "Enter Data for Group" or "Athlete Profiles"
3. Each User can have one or multiple roles. For a user that has multiple roles they will see all of their combined system and modules when they login. To add a Role, click on "Roles"
Click on "Create New Role"
Name and Describe the New Role, then click "Save"
1. Type in the name of the Person in the Text Search Box. 2. If that user has been added to the system, their name will appear. 3. Select the User and click "Add person" (as shown in the image in the step below). Select the User and click "Add person"
Ensure there is a tick beside the names you want to include and select "Add People" at the bottom of the selection box. 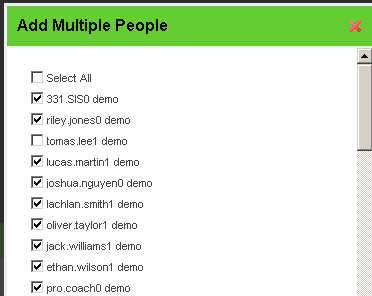 These users will be added to the People section (as shown below). All of the Users will be added and they will be displayed for you. In order for the person to be able to login, they MUST be given access to the "Enter Data" permission. The other permissions that you have access will depend on the type of system that you have developed. 1. Click on "Add Multiple Permissions"
2. 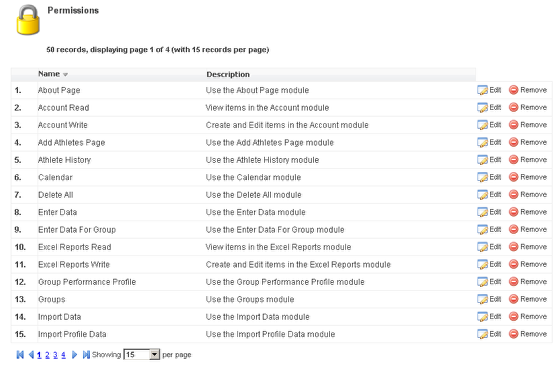 Place a tick beside each of the modules that the user has access to. 3. Click on "Add system Permissions"
Or you can type in the name of the permission into the Search box and ensure a tick is placed beside each one. All of the Event Forms, Profile Forms, Databases and the like will be displayed in a list with Delete, Read, Write, Linked and Calendar Access for each. You need to select which of these you want to include in this Role. For example, a coach may only have read and write access the Fitness testing forms, and a Doctor may have read only access to the fitness forms but read and write access to the Medical Forms. Here you can see that this role has access to enter in new event forms like the Aerobic Max Heart Rate, to only see the database entries from the Agility Session, and to add and view the database entries for the Aerobic Activity Database. Delete: This allows users to delete the entry from the system. ONLY administrators should be given delete access because you need to ensure that data is not removed from the system accidentally. Read: This allows users to access (read) the data that has been entered by a coach or athlete on the reports and history pages of the application, but not enter in any new data. Linked: This allows users to access the data that is linked* from a record that you don't have access to in a form that you do have access to. Link access allows you to access the linked data without actually accessing the original data capture form that it is pulled from. 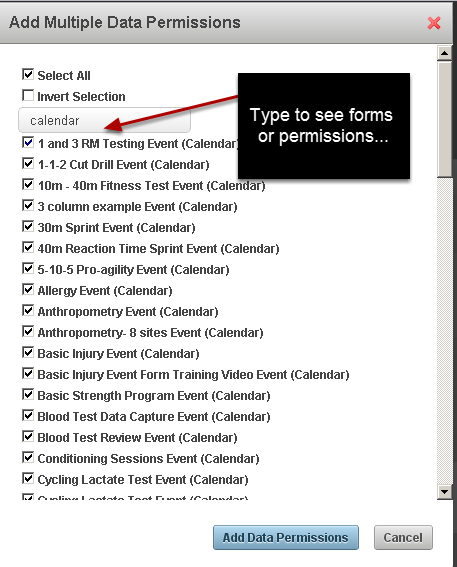 Calendar: This allows users to see the event if it is entered on the calendar*. They can only see the event name on the calendar, but they cannot open or see the data entered in it. *Please note that the Linked and Calendar permissions are explained in the next lesson as they are new permissions that have been added. 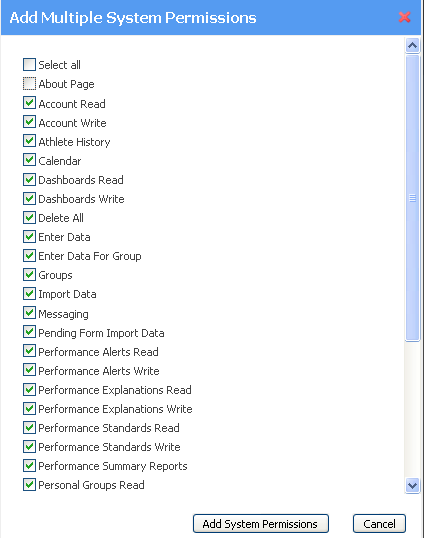 Read access allows users to read and select from the list of database fields (e.g. from a list of exercises) in the data entry form, but they cannot enter in new database fields (e.g. add new exercise into that database list) unless they have "write" access to it. Write access allows users to enter in new database fields into the database list (e.g. adding in a new drill into an agility database). Set this permission carefully as you may only want one or two users adding in new database fields so as to avoid double ups on your database. Delete allows users to remove fields from database, but again be very careful with this permission as you may have data that is entered on the system for a database field, and if it is removed then the data entered will show blank. N.B. There is no read or write permission for this. If a user has access to a specific Category they can access the Resources in it (as long as they have access to the Resources Module). If the user has access to the System Permission Upload-Resources, then they can also upload new Resources into the Category they have been given access to. 2. Click on the permission (as shown in the image here). 3. Click on "add datapermission"
4. 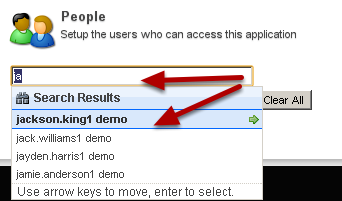 Click on "Add data Permissions"
You now have a search box to use when you enter in multiple data permissions. This means you can now type in read, or write or calendar (as shown here) and all of the specific permission types appear. 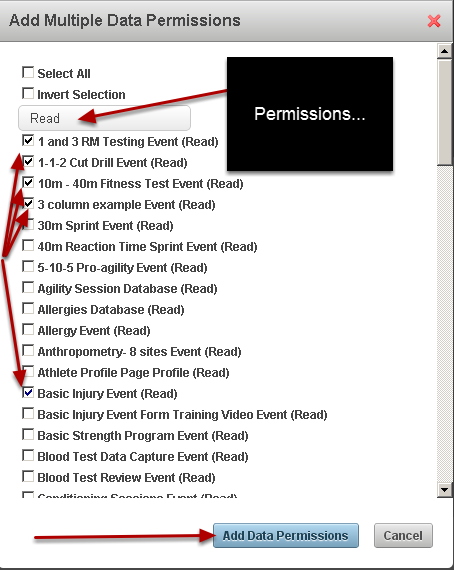 Place a tick beside the forms select "Add Data Permissions". N.B. Please note that you can ONLY enter in the permissions that are ticked and in view when you select "Add Permissions", or "Add Athletes". This means that if you tick some options and type in a different term into the search box, any options that you have ticked that are hidden because of the new search term will not be added to your list permissions list. Another example of limiting permissions by Permission type: Add in Multiple Data Permissions and use the Search Box to limit the permissions enabling you to enter in specific permissions a lot more rapidly. To Remove/Clear Data Permissions, Permissions or Users, use the delete or "Clear All"
If you want to remove a User, Permission or System Permission click on the "Remove" beside the name of the Permission, Data Permission or People. You will be asked if you are sure you want to remove them, click "Yes"
To clear ALL of the People or Permissions from a Role, go to the "Clear All" button. You can clear all of the users or permissions in each relevant section for that Role by selecting Clear All. Again, be cautious with this as it cannot be undone! !